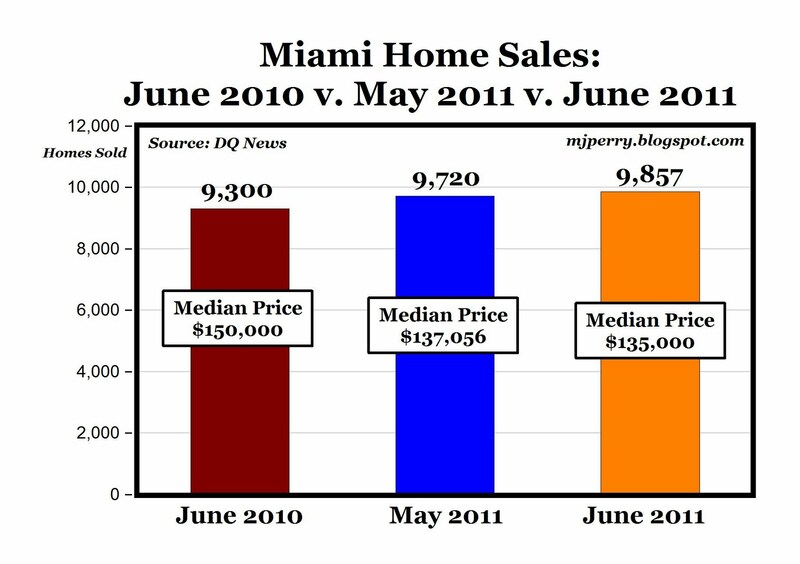 DQ News -- "Miami-area June home sales climbed above the year-ago level for the seventh consecutive month, suggesting this year's lower prices have helped offset the loss of the homebuyer tax credits that boosted demand in the first half of 2010. The median sale price dipped slightly month-to-month and fell 10 percent from June 2010, marking the 45th consecutive month in which the median has fallen year-over-year. June's total sales were the highest for that month since June 2007 (when 10,136 homes sold) but fell 20.7 percent below the average June sales tally of 12,427 since 1997. In June, 9,857 new and resale houses and condos closed escrow in the Miami metro area, and rose 1.4 percent from the prior month and 6.0 percent from a year earlier (see chart above). The 4,911 condos that resold last month marked a 2.2 percent decrease from May but a 12.7 percent increase from a year earlier. It was the highest number of condo resales in the month of June since 2005, when 6,070 condos resold. The median price paid for all new and resale houses and condos sold in the Miami region in June was $135,000, down 1.5 percent from May and down 10.0 percent from a year earlier. 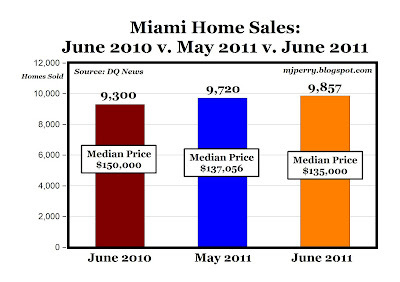 The June median stood 53.4 percent below the peak $290,000 median in June 2007. There were signs that prices in some market segments might be in the early stages of stabilizing. For example, the median price paid for resale single-family detached houses, which stood at $174,000 in June, has risen month-to-month for the past three months, though last month it remained nearly 6 percent below the year-ago level. The median price paid per square foot for resale single-family houses, which was $99 in June, has also increased for three consecutive months, though in June it was still 8.3 percent lower than a year ago. MP: Miami home and condo sales are now back above their pre-recession levels, largely because median home prices are less than half of their 2007 peak level. But it looks like Miami home prices are starting to find a bottom, and if buying activity continues to remain active, the median home prices will eventually start to increase. At this point, it's an incredible buying opportunity, as most of Miami real estate is "on sale" at a "50% discount" from 2007 prices. Note how housing prices "inflated" from $150k to $135. That's a ...wait! That's a 10 percent drop! In one year house prices fell 10 percent in Miami! More odd news: Commercial real estate nationwide is selling for 2001-2 price levels. Commercial real estate has lost roughly one-half of its peak value, according to Moodys. And the S&P 500 is below 1999 levels. Unit labor costs are flat to down for three years. Why are some people loosing their bowels over inflation? Why do some people believe in UFOs? Absentee buyers purchased a near-record 37.1 percent of all homes sold in the Miami area last month, compared with 38.7 percent in May and an all-time high of 39.4 percent in March. A year ago the figure was 31.8 percent. June's absentee buyers paid a median $90,700, down from $98,000 the month before and down from $105,000 a year earlier. Absentee buyers are investors, second-home buyers and others who indicate at the time of sale that their property tax bill will be sent to a different address. Cash buyers purchased 64.2 percent of all homes sold last month, down from 64.9 percent the prior month and a record 68.6 percent in March. A year ago the figure was 56.9 percent. Specifically, these were transactions where there was no indication of a purchase loan recorded at the time of sale. rjs: Do you mean people are buying all-cash down? Why? The advantage of real estate is leverage and the mortgage interest tax deduction. Is this cocaine money? What's up? This is by far the best looking site I’ve seen. "Unit labor costs are flat to down for three years. you trot out this same stupid comment over and over, despite the fact that we have debunked it for you a hundred times. unit labor costs CANNOT be determined without first knowing inflation. they are a function of inflation. therefore, you cannot sue them to say anything about inflation, because whatever inflation number you used is already baked into them. print this out and post it next to your PC so that you'll remember and stop embarrassing yourself in the future. "The advantage of real estate is leverage and the mortgage interest tax deduction. Is this cocaine money? What's up?" more bubble baby thinking from the town idiot. get a 6% mortgage and hold it for 30 years and it will mean you wind up paying something like 500% for your house. the dirty secret of real estate is that if real interest rates are positive, pretty much everyone loses money on their house if they use a mortgage, especially after taxes. home prices tend to track CPI. real interest rates = nominal - cpi. thus, you lose money every year on your home. it's not "leverage" it's a beating. it does not surprise me that you lack the sophistication to see this, as you never exhibit it anywhere else. people pay cash because that is how you actually make money in real estate and because, with interest rates so low, there are few good options to park money with acceptable return. big home buys for cash is a bet on inflation and a response to low interest rates. the big cash purchase % is also likely a function of % of sales that are foreclosures. most states require cash bids for foreclosed property. I recognize you are the Captain-Commandant of the UFO Society of Utah, Flat Earth Division. I will defer to you in all matters regarding flying saucers. But you should not comment publicly about matters of the economy or business. Of course, leverage is a key to successful real estate investing, and of course, the mortgage interest tax deduction plays a role. When you return from your next successful mission to Proxima Centuri, please consult any Utah accountant. "Of course, leverage is a key to successful real estate investing, and of course, the mortgage interest tax deduction plays a role"
as ever, zero evidence, dumb vitriol. if real interest rates are positive, as they have been for 98 of 100 of the last 250 years, and housing goes up with CPI, how do you make money on real estate with a loan? your house goes up 4% a year, you pay 7% in interest and 1% in taxes and then you have to pay for repairs etc on top of that as well as insurance. that's a loss, not a profit, even with a tax deduction. you just think that because you sell for more than you paid, you won. like most americans, you are wildly ignorant about what the costs are in real estate. you really are dumber than rocks. by your logic, if leverage is such a great idea, then you should want a 0 down IO loan. that will just dig you a hole over time if real rates are positive. it's literally impossible for the market to make money under such a case. and, of course, leverage works both ways. take a 10% hit and you can be ruined. your bubble baby stupidity really seems to know no bounds. my honest advice: stick to varnishing bar stools. you're going to get hurt trying to invest. you don't have anything like the education or the brains for it. "In one year house prices fell 10 percent in Miami!" and if only we'd had some leverage, we could have lost everyhting.